My husband and I have led small group Bible studies for years. Over time, I’ve gotten a sense of which studies work well and which don’t. 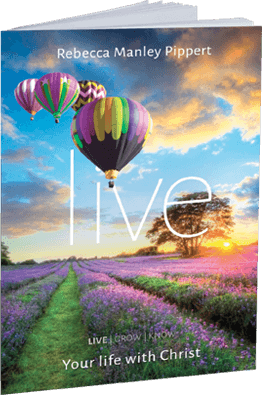 When I heard about the new LIVE, GROW, KNOW series from The Good Book Company, I knew I wanted to take a look at it! LIVE, GROW, KNOW is a new three-part DVD-based series designed to be the “What Next?” and the “How to?” Each session includes Bible study; DVD or downloadable presentations from global evangelist and best-selling author Becky Manley Pippert; guided discussions; and filmed testimonies. It’s perfect for nearly believers, ‘baby’ believers and older believers. Each session focuses on a specific passage of Scripture and consists of a mixture of Bible study, discussion, and DVD teaching. After a short intro on DVD, the participant guide contains a section on historical context, followed by the Bible study section. Next, the “Live What You Learn” section gives practical application. After this, there are several real-life testimonies on the DVD about how and why they became Christians, or what life as a Christian has been like for them. The author, Becky Pippert, gives a short (under ten minute) lesson on DVD, and a summary is provided in the book. Each session wraps up with a “Praying Together” section, and a “Going Deeper” section to read and think about between sessions. Some sessions also include suggestions for further reading. This is a great study! The layout is simple and easy to follow, and Becky’s warm, personal style on the DVD is inviting. The format isn’t intimidating for a new believer, seeker, or someone not used to in-depth Bible study, but the content has plenty of depth. It not only encourages those who have doubts, it lays out very clearly exactly what the gospel is, why it matters, and what it means for our life right now. I’m a fan of any resource that makes it clear that the Gospel is much more than just the “door” or “fire insurance”, and sheds light on how it impacts the life we’re living right here and now. There are several great elements: the Bible study section, which allows participants to dig in and let the Word speak to them for itself before the teaching portion of the session, plus practical application, discussion, and more. I think LIVE is perfect for use in multiple situations: small groups, youth groups, new member or discipleship classes, as a family study, and more. I’m planning to work through it with my teens in the near future, and I’m looking forward to checking out the rest of the series as they’re released! Disclosure: Thanks so much to Cross Focused Reviews and The Good Book Company for providing a review copy of this study. I was not required to write a positive review and was not compensated in any way.